To the Google Chrome installer builders: there are a few things that would be nice to have fixed. 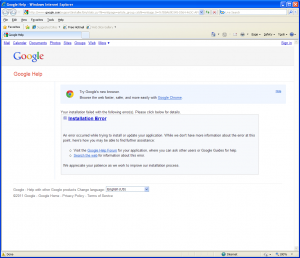 Limited User Account installations: On Windows XP x64 Edition (and probably other versions), trying to install the default Web Install package from here fails with the message “Google Update installation failed with error 0x80070003”. Whatever that means. I have a hunch that on Windows Vista, and Windows 7, the User Account Control stuff might intercept that the installer wants privilege escalation and automatically pop up the right dialog for this. What you see if you try to install the default Web Install package without running as Administrator. If I click on the link “Show me help for this issue.”, there’s not much help there. Oddly enough, I was just reading Microsoft’s “Windows User Experience Interaction Guidelines”. The section on “Error Messages / Error Codes” applies here. I know what you’re trying to say, Google Update is a system service, so it probably wants Administrator rights to my system. It would be nice if it didn’t, maybe if it ran under the Limited User’s profile only. I understand that’s less secure, but ok, I try installing the package with the “Run As” option to escalate privileges to the installer. 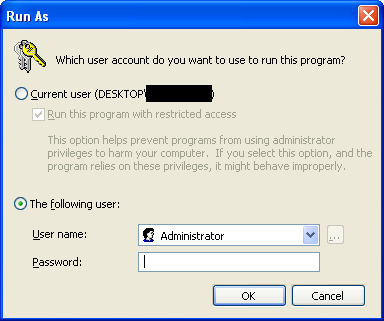 The installer completes, as the Administrator account. But wait, where’s the icon in my Limited User Account? 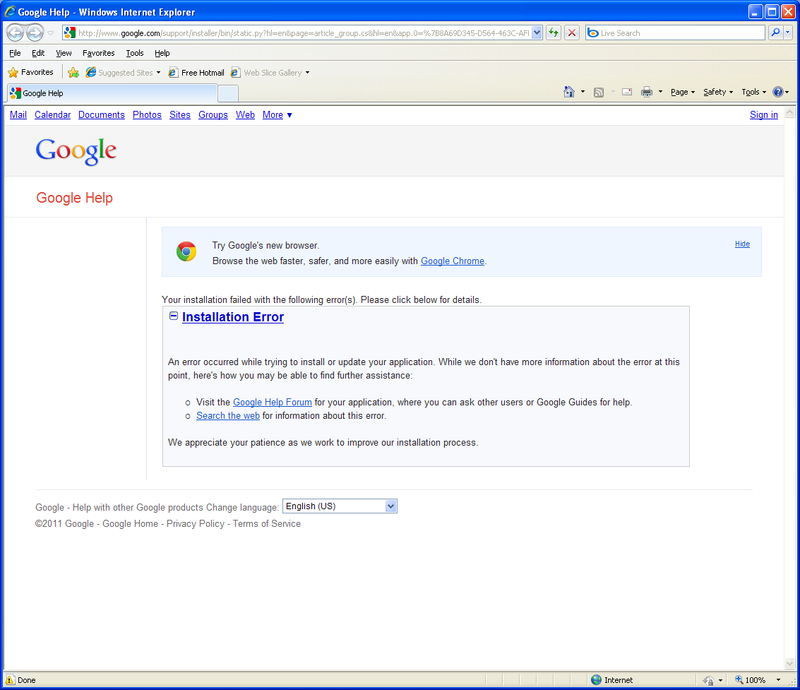 Oh no, the default Chrome installer package only installs to the account whose credentials were used to run it! e.g. Only the Administrator account has Chrome now. Catch-22. So I uninstall you. Then I see that there is an “Alternate (offline) Google Chrome installer (Windows)”, which allows me to download one version of the installer that installs Chrome “for your own user account only” or a version that installs Chrome “for all user accounts on your computer”. The first package doesn’t work, for the same reasons the Web Install package doesn’t work. The second package works, when installed as Administrator, which makes sense. However, when the Installer starts the Chrome Browser for the first time right after installation, it runs the Browser instances as the Administrator account, not as the Limited User Account. Profiles missing for accounts not used during the install. I select a different directory for my preferences, using the directory chooser. When I close and restart Chrome, I get the same error, because the –user-data-dir in the Google Chrome shortcut in my Limited User Account somehow gets reset. 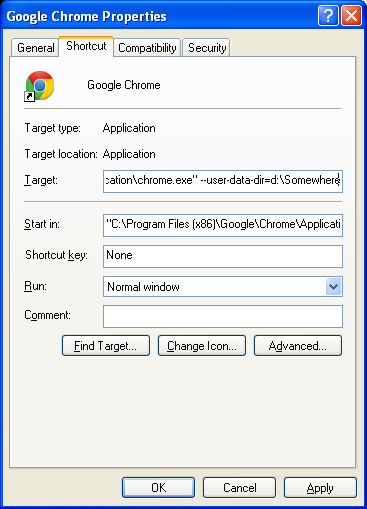 Adding --user-data-dir=(somewhere) to the shortcut allows Chrome to work in a Limited User Account. If I add –user-data-dir to the shortcut located on my Desktop, it doesn’t get reset. I have a hunch here that the multiuser installation will work under Windows Vista and Windows 7 because of that weird profile virtualization stuff Microsoft built into them (and which annoys the heck out of software developers, because we never know where a profile’s files are actually stored). In any case, after all of that, the browser does work fine, but the taste of a bad install experience does not cast a good first impression.